On top: One of the best F18 pics ever and below sailing with Dolphins. 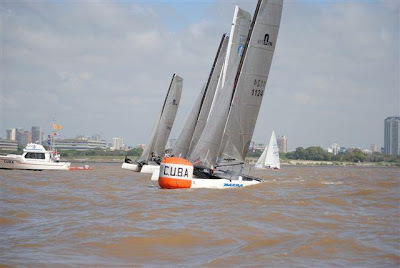 C.U.B.A stands for Club Universitario de Buenos Aires , our main and biggest University (Buenos Aires State) that also promotes a full scale of sports, including sailing. With a fleet of full imported F18s, Cruz Gonzalez won his 2nd championship on his new Infusion. After more than 2 years, another local F18 project is 'online'. Licensed from AHPC Australia, Ian Rodger is locally building a modified Capricorn with an elevated rear beam. Already report on build quality and benefits on that elevated beam. But didn´t have a good pic, so here you go. The 1st Cap was imported, so comparing you can´t honestly tell the quality difference (after that elevated beam of course) Mast, beams, daggers and rudders are imported. 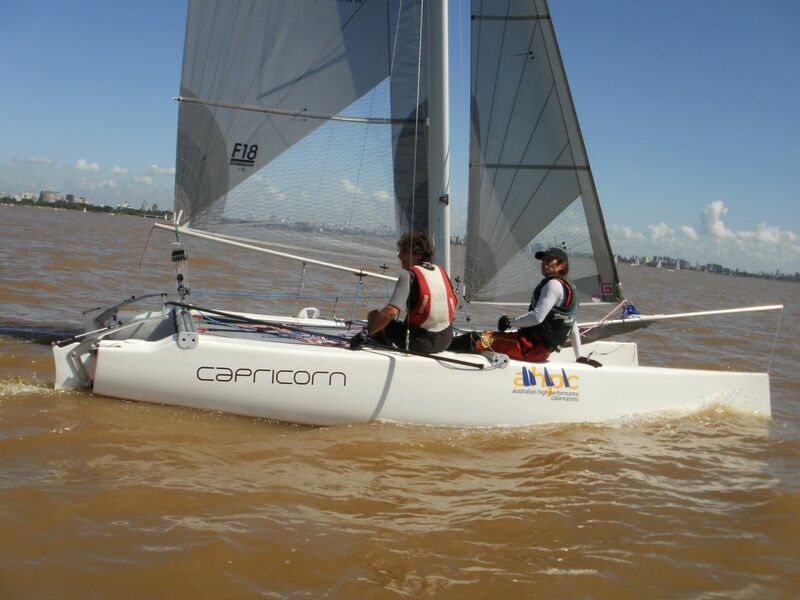 With a lower range price than imported Nacra Infusions and with local support, right now the local Cap is an excellent choice for the South American market. We are waiting for Brazil to wake up too (large H16 fleet), maybe 1st F18 South American on Jan-Feb 2011 ar Uruguay will be the definitive step for them to join us. Above Ian testing his 1st local made Cap. Below a good pic from this weekend showing the modification made in the local mould. 18HT is just that. Light and high tech cats and maybe one day we'll all get tired of riding our F18 Panzers and migrate to the HT. Or maybe the F18 will lower its weights in the future? If you call yourself HT a quality video like this is a must, good promo for the class. Check main cunningham and outhaul setup in those light winds conditions. About the F16 discussion going on, you can't blame them for wanting light boats after seeing this. The limit for these classes to grow will always be costs, but in the future these materials are going to be standard to built beachcats and there will be no need to have +30k for a full carbon machine (I hope..). "The 18HT class is a Formula class, like the F18 but with much more open rules. The 18HT is basically an A-Cat for two persons, with a gennaker for downwind sailing. The class was found 15 years ago by Christian Favre (Ventilo) and Lalo Petrucci (Bimare). Since then our boats and the class have evolved, adopting the latest technologies and matrials and new manufactures joined our class. 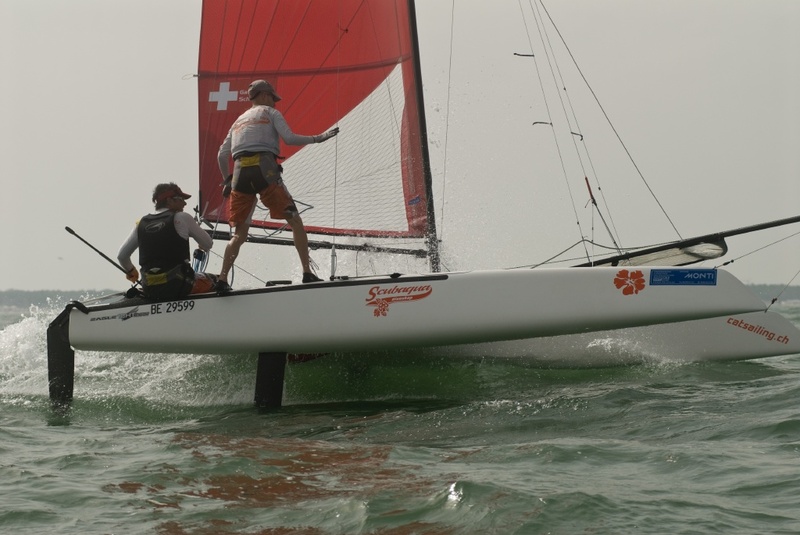 The Eagle 18HT in the video was designed by former A-Cat World champion Niels Bunkenburg. 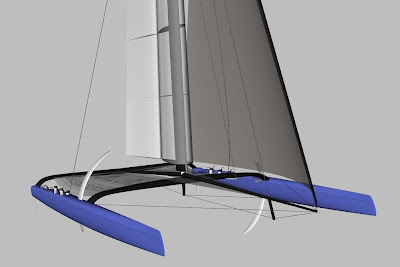 The 18HT Ventilo, was designed by Dr. Martin Fischer. 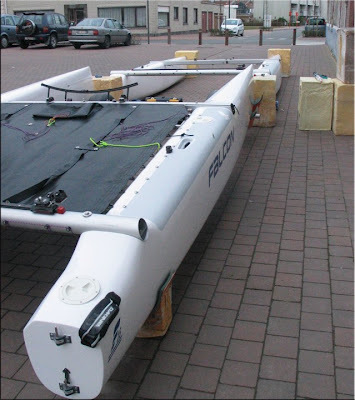 Although carbon is used for building our boats and masts, the boats are still affordable and the price range for a new one is in the same frame or even lower than the F18 class." The conditions were perfect, 14 degrees a blue sky and around 8 knots of oscillating wind. Around 17 sailors exchanged their cats for a laser to train on starts and shifts. We did 5 minute races on a short course. The progress every one made was great! from flipping over to windward, sailing over each other and doing al kinds of crazy things only catsailors can do, they finally understood the boot enough to start racing.. everybody had a blast with playing the game of sailing wich we all love. 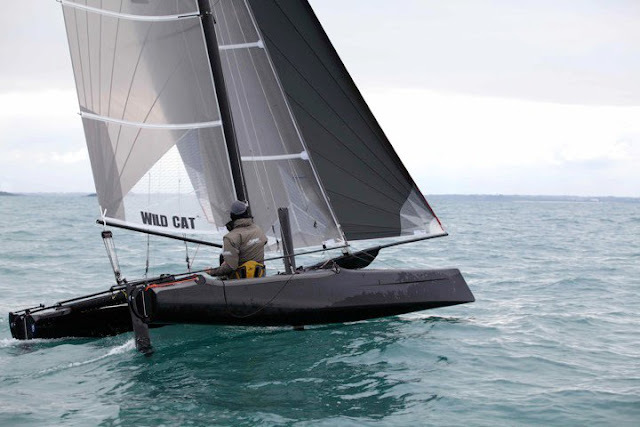 Check out the video and see how catsailors sail on a half boat!! Magic Marine is changing distribution within the British market by appointing former Olympic sailor, Hugh Styles, and his company ‘Time On the Water’ to develop the brand. Hugh, and fellow ‘Time On the Water’ director, David Lush will be introducing the new Magic Marine range at major regattas, shows, and events throughout the UK this year, with a special emphasis on supporting clubs and classes. 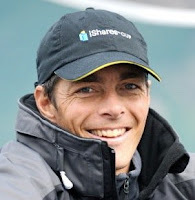 Hugh Styles successes include Laser European championships, Tornado Olympian and prominent skipper on the Extreme 40 catamaran racing circuit. Weymouth, UK – Magic Marine is changing distribution within the British market by appointing former Olympic sailor, Hugh Styles, and his company ‘Time On the Water’ to develop the brand. 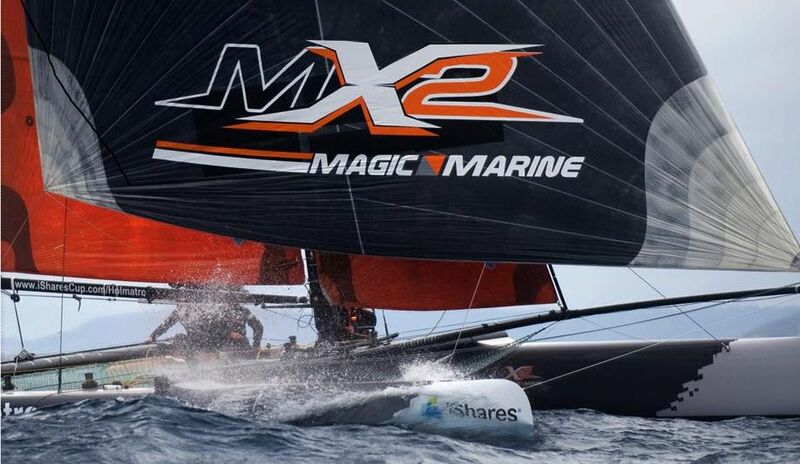 Check Magic Marine site for some of the best sailing gear available. For those wondering how hard is sailing the +20knots 'Sudeste' winds in our river here you have a good example. 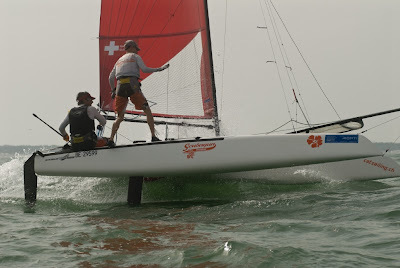 Video taken onboard by Cruz Gonzalez Smith on July 2008 on a Racecat F18 with Landenberger sails. Check horizon line trembling non stop, how bows submerge and recover, a nice 'ramp jump' and also at the end going downwind (no spi) how waves are resembling ski mountain bumps... those similar conditions we had yesterday, add a hoisted spi and you have a good receipe for going down! no matter how trimmed you are sailing. "Why we not start a race at 1 knot? 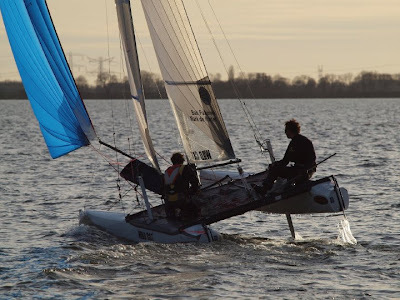 The Bavarian Tornado Gang already reach 14 knots speed at 2 knots last days on lake Constance with their prototype! It is just a question of flexibility. No more excuses why we not start exact on time"
East Coast Piers Race – 100 Days to Go! This year’s East Coast Piers Race, hosted by Marconi Sailing Club will be over the weekend of the 3rd and 4th July. Camping is available free of charge from Friday through to Monday, the galley and bar will also be open all weekend. Probably the longest established long distance race in the country, for twenty two years the East Coast Piers Race has attracted top continental sailors, and development classes, along with the cream of big cat sailors. 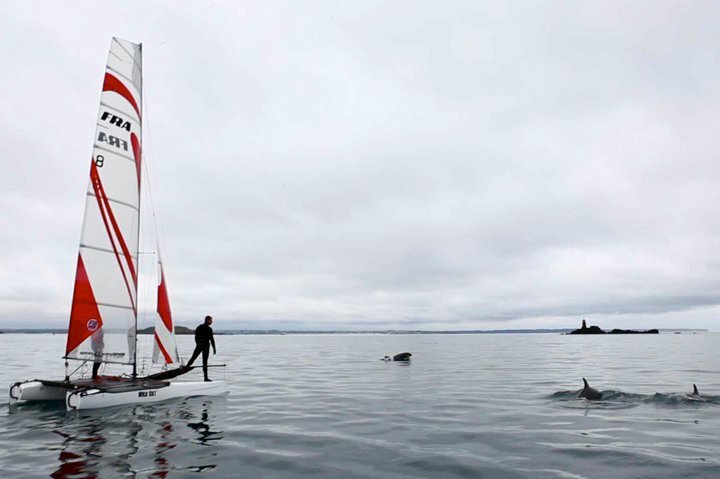 However, the East Coast Piers Race isn't just for big cats - a shorter, but no less demanding course (known as The Colne Point Race) is always available for smaller cats. The course is marked with cruiser "mother ships" flying orange flags, and quite easy for first timers. It is a challenge, but a manageable one. You sail from the start of Osea Pier, down the Blackwater Estuary to Bradwell, across the Estuary, and then along the coast passing Clacton Pier and turning at Walton Pier. The shorted course turns at Colne Point making the race 29 miles rather than 50.
still managed to raise over £18,000 for charity and put on a race. We really can’t do this without the support of our sponsors and the competitors, so thank you. Please note that age restrictions apply and certain safety equipment must be carried by each boat and its crew. Pos'n Helm Crew Club Class Sail. This is ABC for rookies and a speech I repeated to all my clients a hundred times. 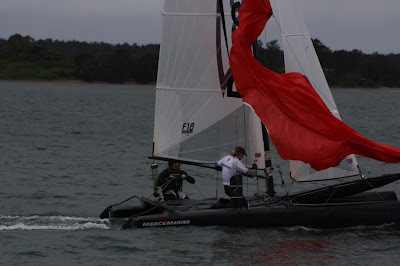 Today racing in tough conditions, some Infusions were pitch poling hard, the other local cats were submerging and abondoned, I was sailing with one of my clients, Javier La Fuente, owner of a RC, in my boat. The RC F18 I has lots of margin in these condiditions due to huge volume in front. We weren´t coordinated on the 1st race but as many others were down, we ended 3rd and we did last 100mts without spi. 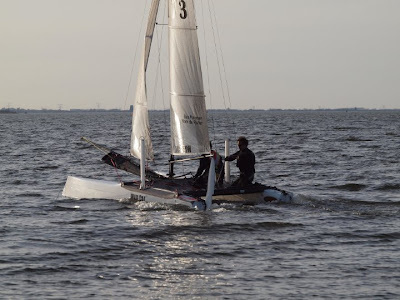 On the 2nd we coordinated a lot better and flew upwind after 2nd tack, then we hoist the Spi, easy as it was hard, but short heavy (Literally almost mud consistent water!) waves were all around, we smashed hard down on one , I shouted to let go the Spi, he reacted late or didn´t release full and to prevent pitch pole and as last attemp, I let go the main sheet instead of the traveller....... goodbye mast! f...! I'm p... off , that Landy Jib was like new! the main suffered but its 'ok' considering, and the spi was left intact. I need vacations after four good years dedicated to cats! so maybe the blog maybe will stay on stand by mode from this weekend onwards, or with less posts at least. Right now we have 700-1000 a day! Not bad for 1 1/2 year of existence. 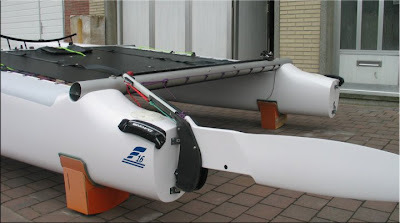 In 2010, the Zwitserleven Sailing Week continues last year's high performance formula. This means that the island of Texel is the centre of exhilarating water sports from Monday 14 to Saturday 19 June. Both catamaran sailors and windsurfers will jump into action. 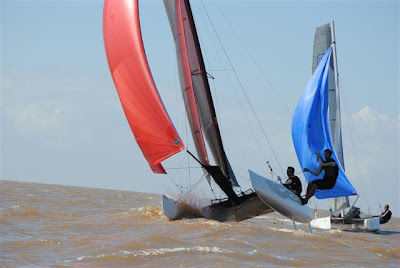 But demonstration sports with skiffs and kite surfers are also part of the programme. As always, the climax is the massive and, by now, legendary Zwitserleven Round Texel on Saturday 19 June. 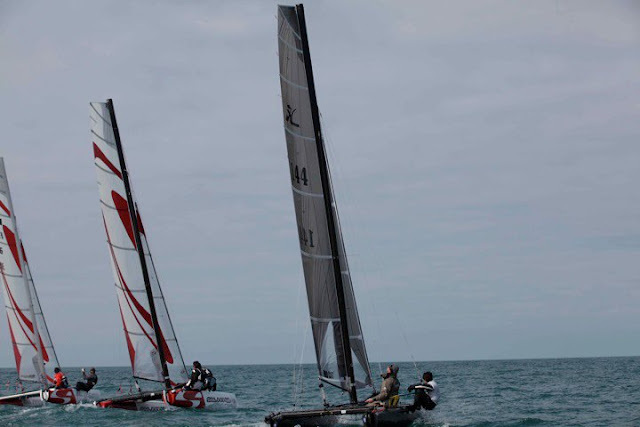 Then hundreds of multihulls participate in the world's biggest cat race. 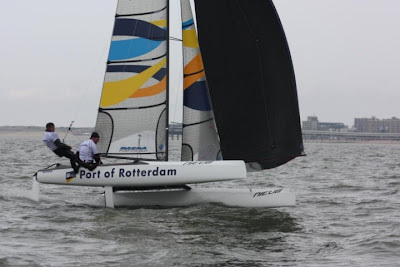 "The new approach made the Zwitersleven Sailing Week even more attractive to the public. According to the police, about 25.000 people visited the island on the day of the 'Round'. That's about 10.000 more than in previous years", says the spokesperson of the Zwitserleven Sailing Week. On Monday 14 June the Zwitserleven Sailing Week starts with the Nacra International Championships and the Grand Prix Slalom for windsurfers (sanctioned by the International Funboard Class Association). The international contest among the Nacra sailors for the world's title lasts until Wednesday morning. The boards will compete for the last time during the finals on Saturday 19 June. That happens right after the gigantic catamaran fleet departs for its race around the Island of Texel. 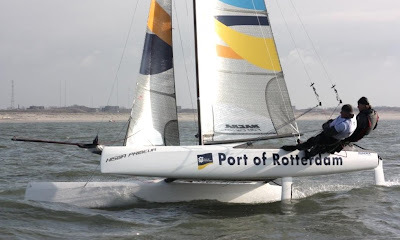 On Wednesday afternoon 16 June, the competition for the Dutch Open Catamaran Sailing Championship starts off. During the first three days the teams race around buoys on a racing track. On Friday afternoon the best crews get into action again during the TNG Short Track Races. 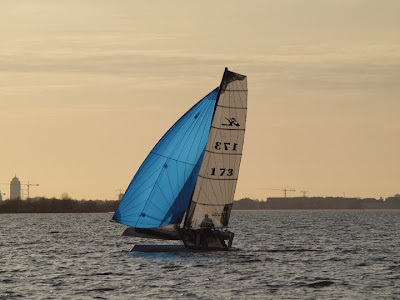 Recreational sailors can enjoy themselves during the traditional Horstocht (to the southernmost point of Texel) and the 'Trip to the North' on Thursday. Sailors and visitors can gather information whilst they walk through the pit lane on the beach. From Wednesday, the party tent opens with a spectacular entertainment programme. The degree of high performance grows due to the addition of kite surf and skiff demonstrations during the week. On Saturday morning 19 June the flood line at Paal 17 (numbered post at the beach that indicates the location) changes into an impressive parade of brightly coloured catamarans. Once they have managed to break through the surf, they start to line up for the kilometre long starting line. At around 13:00, racing officer Jaap Tirion signals the start from a helicopter with a smoke signal. About 500 to 600 boats are expected to compete, including international top teams. 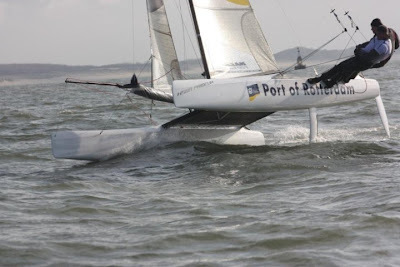 Overall Zwitserleven Sailing Week winners and F18 World Champions of 2009 Coen de Koning and Thijs Visser will compete against multiple national F18 champions Mischa Heemskerk and Bastiaan Tentij. Heemskerk won the Zwitserleven Round Texel Race twice before. Strong foreign competition is also expected. 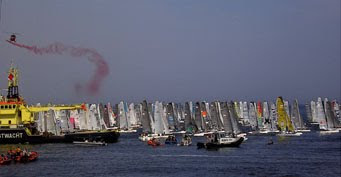 In 2009, the Zwitserleven Round Texel developed into the Zwitserleven Sailing Week. This innovative water sports event combines several spectacular activities. 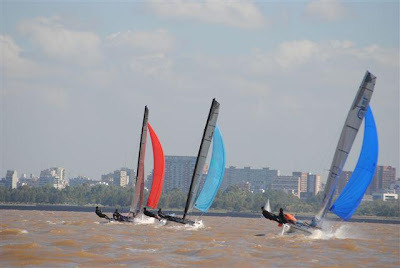 By adding high performance sports such as windsurfing and kitesurf- and skiff demonstration sports, the event becomes more varied and challenging for its participants, and more interesting for the public. GP Slalom windsurfing, from 13 until 19 June 2010Nacra Int. Apart from title sponsor Zwitserleven, VVV Texel, TNG, Treffers & Kappa, Paal 17 Events, Nissan, ROC Mondriaan, TESO and Liebherr support the event. Nacra F20 designers, Melvin&Morrelli, worked on BOR90 amas, and they trickle down some features to the Nacra F20, and now scaled up to the Extreme 90 project. 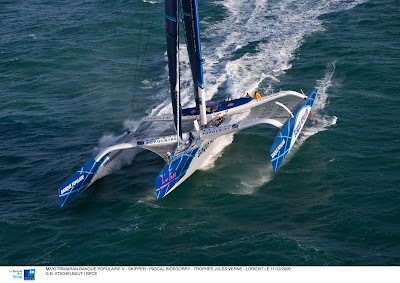 BOR90 Designers are VPLP (Groupama, Banque Populaire...) check high quality images of BPV amas. Looks familiar? I like these bows, scaled down to a beachcat you have the F20 style. We will see these on an F18 soon. 1st try, 1st win, nice debut. 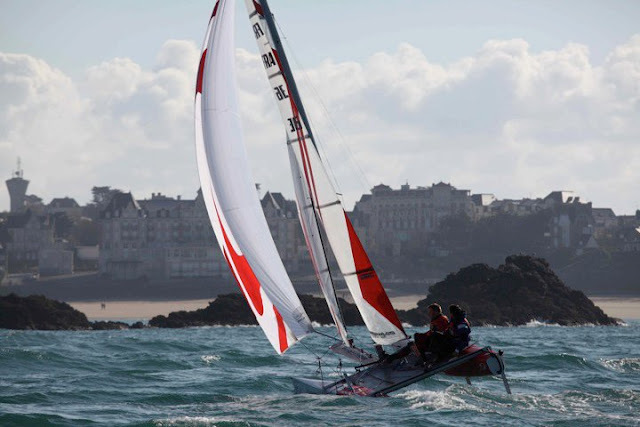 "I sailed with Emanuel Le Chapelier and we won the first race of the britany long distance championship this weekend at Brest (Raid Iroise). In their fleet, Viper were 1st and 2nd. good week for Sailfast and AHPC." Set to my knowledge by VPLP, a more angular and refined bow deck is making a way on beachcats. VPLP's Banque Populaire V and the 2nd version of BOR 90 Tri are a good examples. 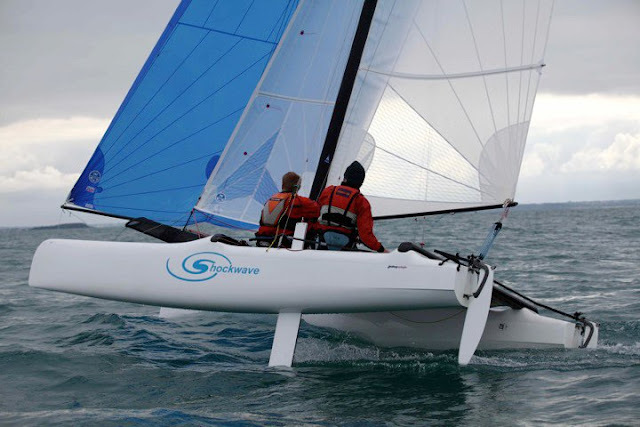 This new trend is being used by Morrelli&Melvin in their Nacra F20 recently launched. Acording to Pete Melvin the main benefit is a better recovery from a bow pitch, offering less resistance in the way back up. To me it also provides a stronger structural deck due to hard angles acting as horizontal beams. The same way a full spray rail does. 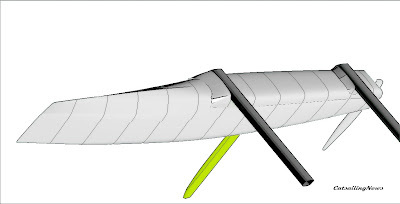 This angled deck gives a modern and futuristic look (Check f18 draft cad drawing to identify deck lines and style being described). The 'rounded bow deck', trademark of Loday-White cats (Spitfire, Darts, Shockwave) it is also a good solution for structural and slicing through waves features, I used that deck style in the 16, and it works way better than the RC I big square deck. RC 16 rounded deck (right). This little boat is a rocket, although this bow reduced reserve volume compared with the RC F18 I, it proved to be way more efficient, with smoother recoveries and less speed lost. Design below water line are key, but a good design must take account of several aspects in different conditions, one thing learned in last AC, is that you can´t design for an specific condition in mind... unless you are 100% that 100% of the races will take place in the perfect weather conditions you dream off while gambling almost to nonsense. For those that didn´t read Pete Melvin´s post on bows and wave piercers click here. 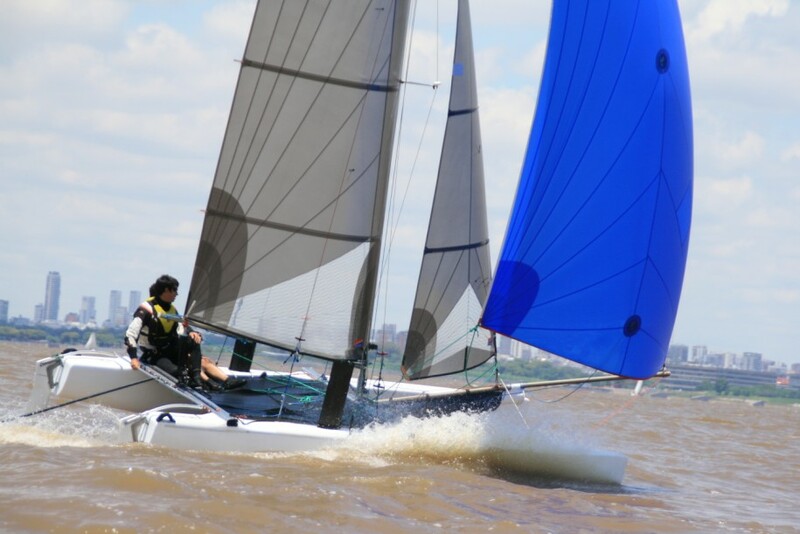 The feedback I had from the Wildcats at Uruguay (5 of them there now) and also from Alex Udin and Sail Innovation boat selection, is that the WC seems to be the most refined design concept, specially Martin Fischer propietary foils sections used, also I´ve been told to be superior to the Infusion in some conditions. Although a little nervous downwind, and I like margin at that point of sail. 2010 will mark the real status of the Wildcat, as a reasonable post launch time has passed now allowing Hobie to refine little details, quite common with new boats. 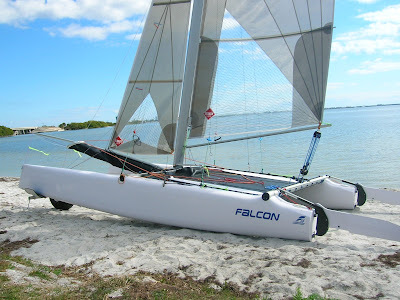 "First Sail with our new Wild Cat F18! 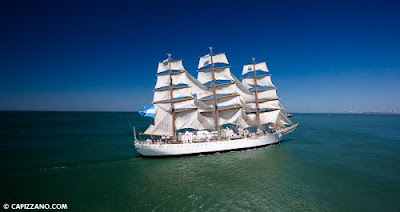 Beautiful day, beautiful sail, beautiful boat!" All Photos by Tony Mels. Guts. 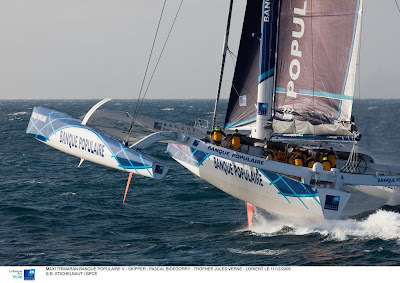 After being behind by more that 400nm Franck Cammas and crew have broken one of the toughest records to achieve. And now they´ll participate on next VOR. Hope they still race on the VX40 circuit too. 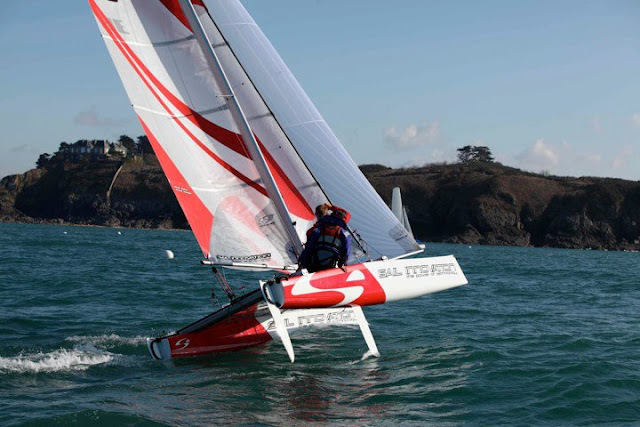 But what I want is to see Franck Cammas again at next F18 Worlds at Erquy this year. 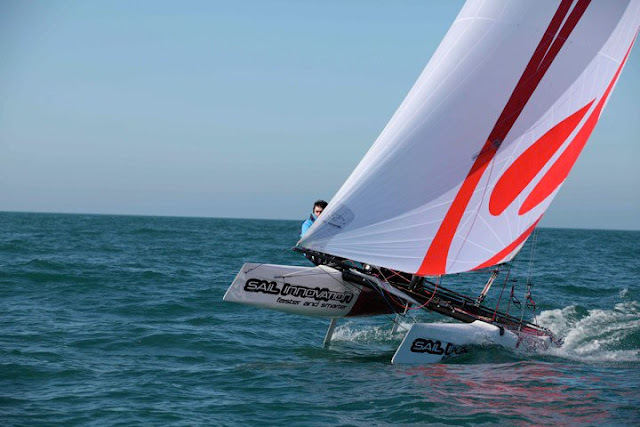 After a close call on 2008 (2nd) , a championship on the F18 will surely will crown him as the most talented sailor on the planet. Spring paradeSetting out on 31st January 2010 whilst the weather `window' was not particularly favourable, Franck Cammas and his men have alternated between some extremely fast sequences and some very slow ones. 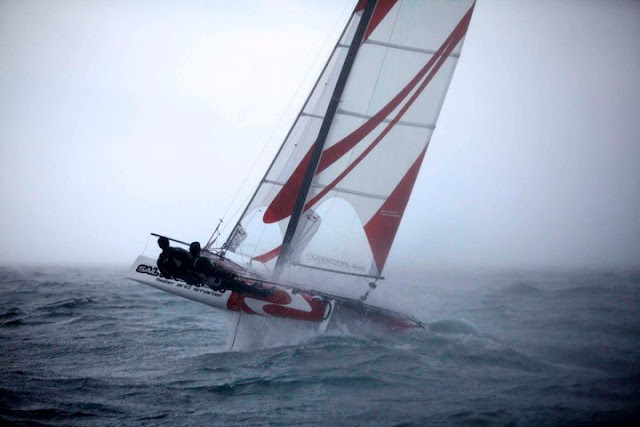 Indeed, the conditions were very varied on this round the world, and even the wind rarely exceeded 40 knots. 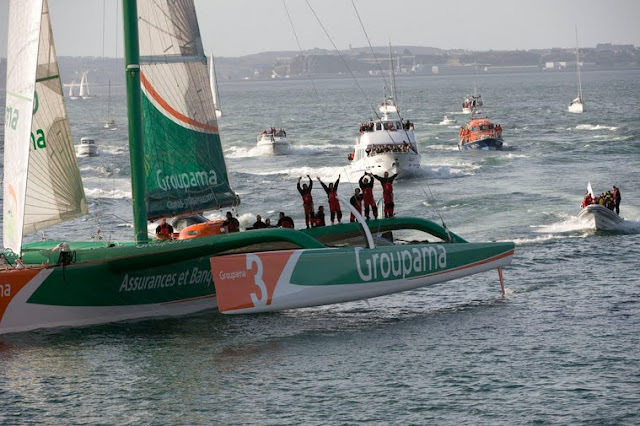 It has to be said that the chosen trajectory sought to avoid the heavy seas and the overly strong breezes, which considerably increased the distance to travel: in fact Groupama 3 sailed 28,523 miles whilst the official optimum course amounts to 21,760 miles. 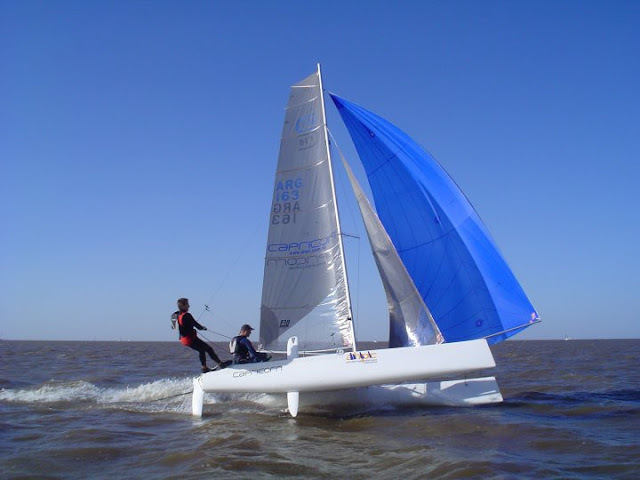 As such, in terms of actual speed across the ground, the giant trimaran maintained an average speed of 24.6 knots! 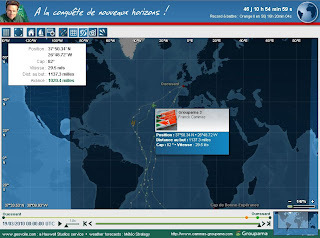 The trickiest zone, both on the outward journey and the return proved to be the South Atlantic. During the descent problems arose due to the calms and on the ascent due to the headwinds. After being more than 400nm miles behind, G3 is now ahead, hope they can make it. In the disturbed air flow spread all over the Atlantic, Groupama 3 carries on its rapid progress towards the finish line and substantially increases its lead over the reference time. The arrival at the Créac'h's lighthouse is still scheduled for Saturday, but the time frame remains open all day as the low pressure area could slow down the giant trimaran. If the departure's weather window was narrow, the gates of arrival are now wide open! But 1 500 miles away from Ushant, Franck Cammas and his men are not done yet with changing conditions: by having to approach the center of low pressure which is currently pushing the giant trimaran, the wind will become more unstable and should suddenly change from South-West to North-West. The wind will also strengthen to over thirty knots with gusts in the squalls and the crew will therefore have many maneuvers to undertake until the entry of the Gulf of Biscay. "The sea is short, the wind is not very stable: it does not slide that much. But the sky is very clear unlike yesterday. On Wednesday night, we got it all: the wind went from six to thirty knots! With a flood of rain on top of that. Since we went through the front, everything is going much better, from wind to sea. However it will evolve as we get closer to the center of the low pressure area." 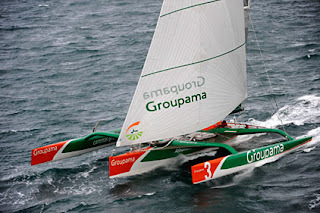 Franck Cammas indicated during the videoconference from 1230 with the Groupama's Race HQ in Paris in the presence of culinary presenter Jean-Luc Petitrenaud. Front Canvas...After 46 days at sea, the crew is starting to get impatient and although the distance between land and the sailors is reduced by great surfs; we felt during the video conference with Franck Cammas that the crew was eager to return to their family ... and to normal food!" James Ogilvie is president of the Australian F18 class, and also a dedicated sailor. 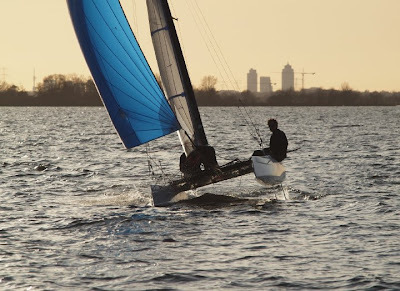 His black Nacra Infusion 'a la Heemskerk' looks nice. But to achieve that style they had to strip the the entire white gelcoat layer! (not an easy task on the Infusion as it has a good thick one) to reach the 1st internal laminated fiberglass and start all over again. I published a onboard video some days ago of blackie. 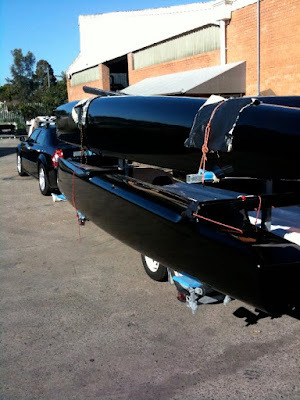 "Paint work is from our sponsor, Durepox Paints www.durepox.com.au , they also have a black Nacra 5.8"
"The boats was fully stripped back to glass and painted with platform weight now sitting at 181kg" he points. They can´t afford more weight as they are racing 180kg of crew! To compensate that disadvantage (at least in calm weather) they ordered from Landy a special set with added draft. "Once we moved spreader rake back to 50-55mm the boat has taken off, double trapping in 5knts and giving all the top guys a run for their money these days. [censored jeje] who you know is rather pissed we beat him and his Infusion all the time now. Would recommend the fuller Landenberger cut to all, and just depower when needed." I remember to see the majority of European Caps with Landys for some years and in last Worlds at Belgium, maybe now we'll start seeing Infusions with them too. 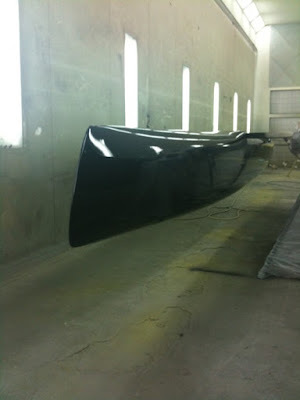 Contact Landenberger One Design for more info about your custom sail. Check the right pic above of their car.... full black package! 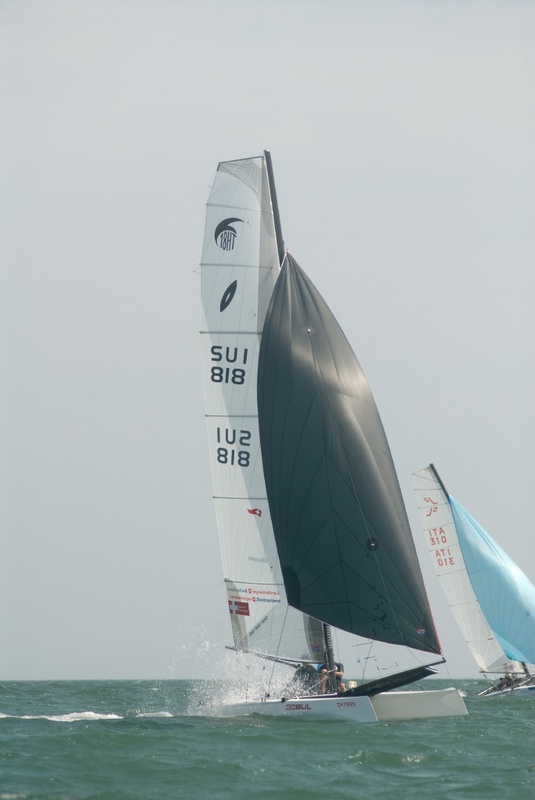 Photo Alex Udin/Sail Innovation - And... how it went? 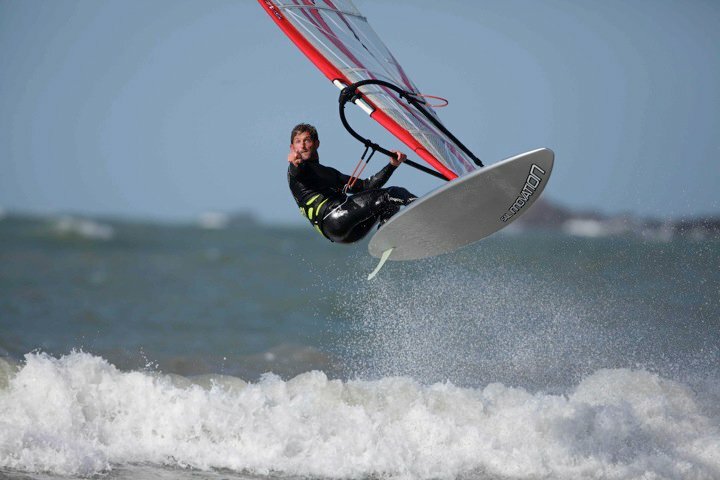 What will happen if SI sails perform better in some conditions than 'stock' ones? What Mischa will do? mmmm tough call. Also check the Cap with Wildcat rudders. The F18 it's a great class, you can grab the best feature of every boat and create yourself a 'Frankie' performer. Alex is gathering some good info with these intensive trainings. But we'll have to wait until 2010 Eurocat to make a first real analysis. Also his shots are getting better, those hundreds ramdom pics taken with his camera...(watch out Pierrick!) nice contrasts and also the best hull detail pic yet of one of my favorites F18 designs, the Shockwave. May God hold you in the palm of His hand"
Like Australia and USA this country was made by immigrants, here mostly Italian and Spanish, but also Irish, and from several other european countries, majority of roman catholics. 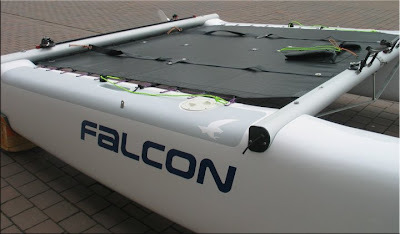 I like the Falcon, it resembles a scale down Infusion, already pointed this in other posts, but to me there´s not much room right now to refine both hull designs. The Infusion is a planing machine in high winds with lots of margin downwind (the way I like it) and a good performance in calm weather, right now it can get better than this in my view, but wait... I have to sail the C2 ! 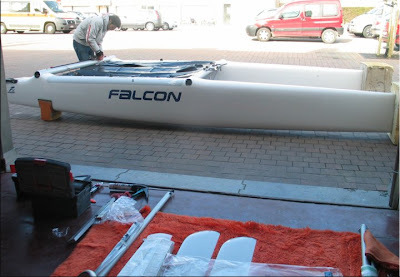 Didn´t sail the Falcon but to me is definitely a performer and the perfect example of the beachcat hull evolution with a high volume trademark. Congrats to Matt McDonald and the guys at Falcon Marine LLC for such a fine F16 design.